This post was originally posted on Guider Stephanie’s blog Life of a Twingle Gal. Thanks Stephanie for sharing it with us! This past weekend, we held our first camp of the 2012-13 Guiding year! I’m a leader with Girl Guides of Canada-Guides du Canada, working with Guide and Pathfinder aged girls. Our Guide Unit has grown in size from last year, which is amazing! We have 11 girls in the Unit and six of those girls came out to camp with us. Pathfinders has only opened this year and we have two amazingly enthusiastic girls. The girls arrive at 1pm on the Saturday and we quickly got to work setting up camp. We set-up all the Unit tents to find out which ones were still in good shape, which had broken or missing pieces and which ones needed to be retired. Of the 10 tents, we managed to find 5 that were useable. There are a couple with broken or missing poles, one has a torn zipper and others were missing the rain fly… kind of an important piece when the forecast is rain. One of the five tents we used actually had a gaping hole in the tent floor, but a green garbage bag and some tuck tape patched it right up. Having been the lucky person to use that tent in the rain, I can say my handy patch work held up nicely! Once we finally got camp set up, we had a light snack of apples and oranges and moved into crafts. The girls scoured the grounds for leaves that had fallen and we then made fall luminaries using the leaves, empty baby food jars and a little white glue. We then popped a battery operated tea light into the jar for a beautiful little lantern. The girls, of course, then used them to create a haunted house in the tree fort later that evening. For dinner, we tried something new: tacos in a bag! Thank you Twitter for introducing me to this fabulous camp meal. The girls loved it and frankly, so did I! So easy and delicious and very little clean up. The girls were divided by patrol into either meal prep or meal cleanup. The Swallow patrol was on prep and had to dice up onions, lettuce and tomatoes, and grate the cheese to top our tacos. It’s always a pleasant surprise when girls know how to wield a knife when dicing food! We then sat around the fire to eat our tacos and discuss some of the things that are important when camping, such as Be Prepared kits, fire drill protocols and more. Then the girls shared silly stories that had us all laughing and trying not to choke on our food. Once dinner and cleanup was done, we settled in front of the fire to ward off the dampness and participate in the campfire our Pathfinder worked so hard on. There were lots of giggles as we acted out silly stories and made goofy noises to go along with them. 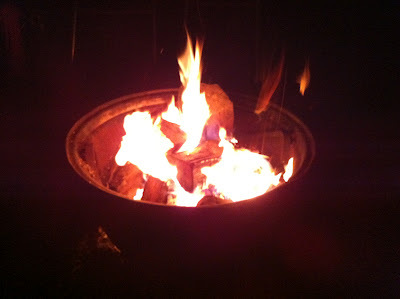 Of course, a campfire wouldn’t be a campfire without singing and there was lots of that. Thank goodness Sunflower warned her neighbours we’d be there; we may have been a tad loud when singing Thunderation! The girls were all asleep by 11pm. This is usually unheard of at camp and I was surprised. I lay in my tent awake for quite a while, listening to first the raccoons chattering and then the rain. I wasn’t cold despite the rain and cool temps, but I just couldn’t get to sleep. Finally, I dozed and woke at 6:30 when my internal alarm clock when off. I remained in my tent until I heard the girls waking at 7:30, then we got the day going. Canary patrol was on breakfast prep for bacon, eggs and toast. We were eating by about 9 and I gotta tell ya, a hot breakfast on a wet morning is delicious! After cleanup, we set about striking camp and somehow, we managed to get all the tents dried for storage. We’ve compiled a list of things that need to be repaired or replaced before our next camp, but all in all we had an awesome time! I can’t wait to evaluate our camp this week at our meeting and find out what the girls thought about our first overnight excursion. The girls were already asking when our next camp will be. We have one booked for April, but we might just need to schedule another one in between! – By guest blogger Guider Stephanie. Stephanie has written a previous post for our blog: Monday Musings about Guiding. Read more by Stephanie on her Life of a Twingle Gal blog. This is a great way to wean the girls into the theme of camping. I know that when I was in guiding that some of the girls had doubts of camping. I think that it was a perfect idea that you were able to create camp in one of the leader’s backyards. Perfect scenario to get the girls interested in camping, and to get a taste of what it is like for a weekend camp. It sounds like they are very enthusiastic about the following camps. Great job ladies!